Going to a party? Need a quick dessert? Then give this recipe a try. Easy Oreo Cheesecake Filled Shells will be ready before you are and they are fast, easy and of course, delicious. 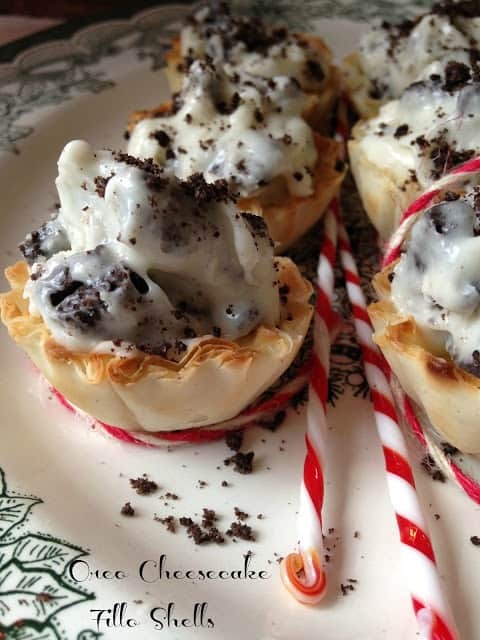 Made with one of my favorite cookies, the ever -so-humble Oreo cookie, cream cheese, mascarpone cheese, confectioners’ sugar and Athens mini fillo shells. 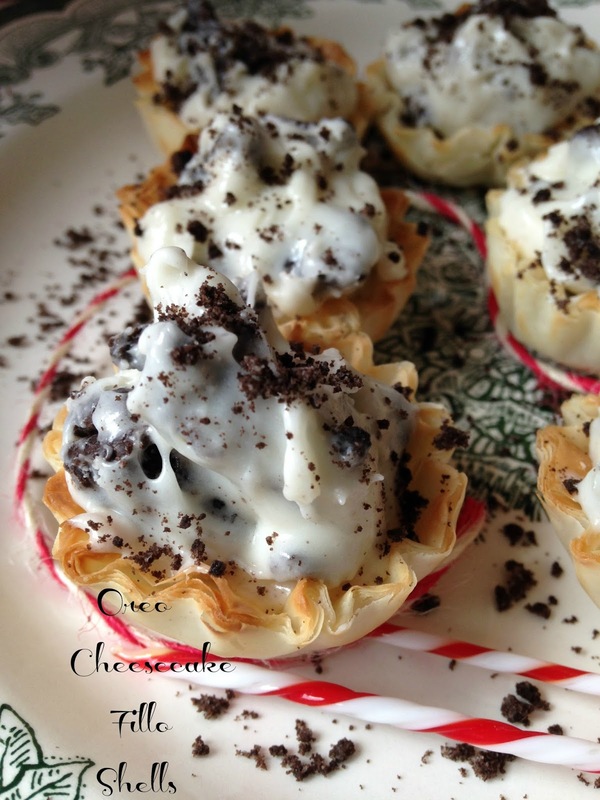 You might want to make a double batch of these delicious shells, they wouldn’t last long. Phyllo [FEE-loh] Literally translated, the Greek word phyllo means “leaf.” Culinarily, it refers to tissue-thin layers of pastry dough used in various Greek and Near Eastern sweet and savory preparations, the best known being Baklava and Spanakopita. Phyllo (also spelled filo) is very similar to strudel dough. Packaged fresh and frozen phyllo dough is readily available. Mascarpone [mah-skar-POH-nay] Hailing from Italy’s Lombardy region, mascarpone is a buttery-rich, double-cream to triple-cream, cow’s milk cheese. Technically it’s nit cheese rather curdled cream because citric or tartaric acid is used rather than a rennet. It’s ivory colored, soft and delicate and ranges in texture from that of light clotted cream to that of room temperature butter. It’s versatile enough to be blended with other flavors and is sometimes sold sweetened with fruit. This delicately flavored cheese needs little embellishment other than being topped with fruit and/or honey. In a large bowl, beat cream cheese until light and creamy. Beat in mascarpone cheese, powdered sugar, vanilla extract and milk or cream. 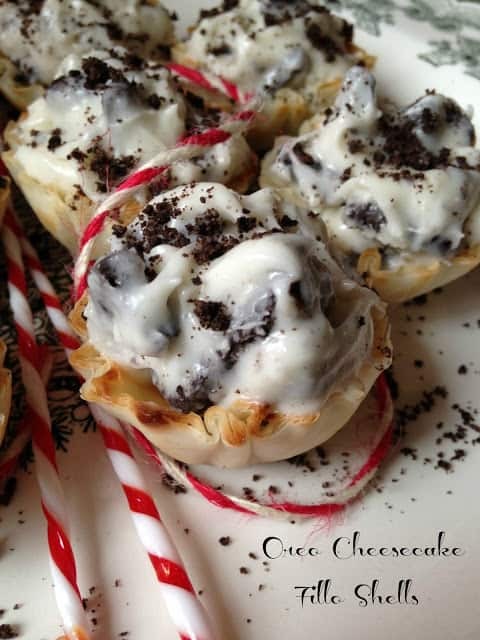 Fold in chopped oreo cookies. 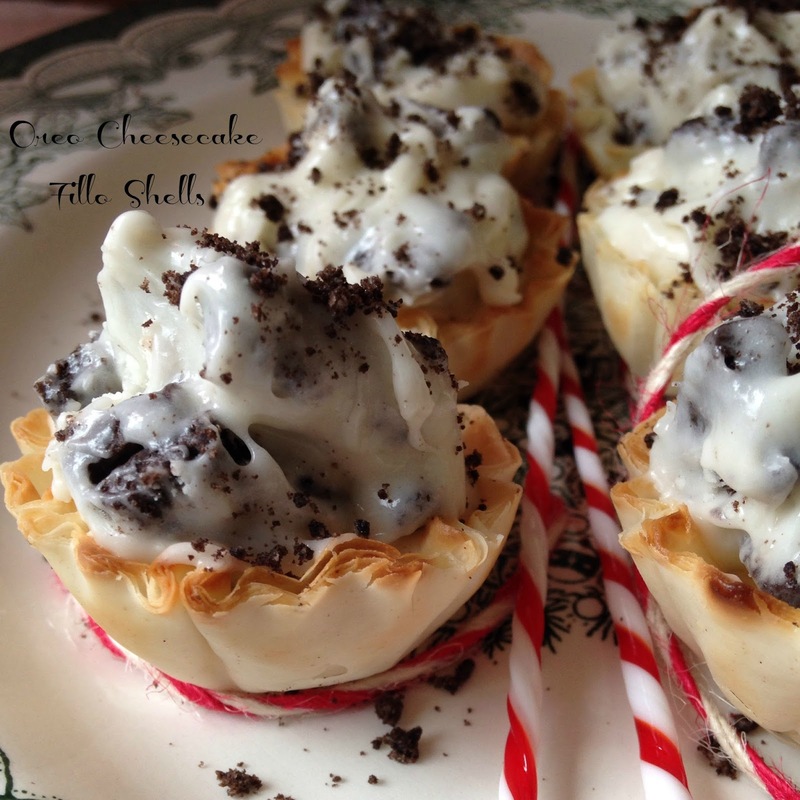 Fill mini shells with 1 rounded teaspoon of oreo cheesecake mixture. Chill shells for 1 hour. Sprinkle with crushed oreo cookies. Serve. Hi Lynn, this dessert look very inviting. Thanks for sharing. Merry Christmas to you and family. God blessed you with abundance of joy, love and happiness.